Candied citrus zest (aka candied citrus peel, crystallized citrus peel) is very useful as a garnish or as an ingredient in both savory and sweet dishes. You can use it as a garnish for cocktails and other drinks too. It is sweeter and more tender than plain zest. 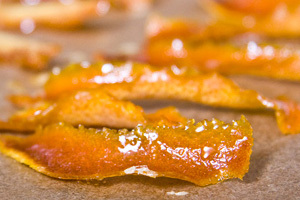 This method is often used to make candied lemon peel, candied orange peel, or candied lime peel. It can also be used to candy grapefruit peel, yuzu peel, buddha’s hand peel & meyer lemon peel. 1. Peel the zest in large strips off of the washed citrus fruit. The easiest way to remove zest from citrus fruit is using a conventional vegetable peeler and long broad strokes. As each large strip comes off the fruit, inspect the inside of the piece for white pith. If you’re using the zest raw instead of candying it, it is important to remove as much of the pith as possible (scrape it off with a knife point). If you’re going to be candying the zest, it is less important to to remove the pith. 2. Make a 50/50 simple syrup. Simple syrup is so named because it is simple. All you have to do to make simple syrup is dissolve 1 part granulated sugar in 1 part water (i.e. 1 cup sugar, 1 cup water) in a saucepan on the stove. 3. Cook the zest in simmering syrup. Stirring occasionally, cook the peel until it becomes semi-translucent and shiny. 4. Lay the zest out on parchment paper to cool. Take the zest out of the syrup with a pair of tongs or slotted spoon (do not throw the syrup away! See uses below). Lay them out on a sheet of parchment paper to cool, making sure the strips of zest aren’t touching, or they will stick together. For soft, chewy, zest: let it cool slightly, slice to your desired thickness (chiffonade-like thin strips are traditional) and toss in granulated sugar to coat. Store in an air-tight container and use in cookies, cakes, mousses and ice creams. For crunchy zest or zest powder: Put the parchment paper with the zest in a sheet pan and bake in a 225 degree oven to dry out (don’t let it brown). Once it is hard and crispy, remove it from the oven and let it cool. Make hard citrus peel following the instructions above, and once it is cool grind it into powder using a mortar and pestle or a coffee grinder. Candied zest can be used to season dishes as-is, or added to spice rubs. It will keep for about three weeks in an air tight container. The citrus infused simple syrup can be saved in the fridge and has a variety of delicious uses. It can used to sweeten and flavor mixed drinks and iced tea, cooked down into caramel, used to make homemade sorbets, or drizzled over cakes before frosting to help keep them moist. Citrus zest is the colorful top layer of citrus fruits’ peels. Not only is it a good source of color in dishes when used as a garnish, but this layer harbors flavorful and aromatic oils. This makes zest a great way to add citrus flavor to dishes where the acidity or water content of the fruit’s juice would be a problem. Using the zest from citrus fruits will help you get more flavor (and therefore value) from your food budget. Just keep in mind that “bald” fruit which have had their zest removed do not last as long as intact fruit, so try to use them soon after zesting. Just below the beautiful tasty zest, but above the actual edible fruit, lies the white pith. This stuff is tough and incredibly bitter. Any culinary work you do with raw citrus zest should involve a sincere effort to keep as much of pith out of your zest as possible. If using a grater to remove your zest, this means keeping a careful eye on the fruit as you grate. Nicely presented article. I just tweeted it. I just started blogging in May and just found out about your website a couple of days ago. I have subscribed to your blog and look forward to looking around your website. Welcome to the culinary blogosphere Lea Ann! Thanks for subscribing!